Nobody ever renounced the imperium of hyperspace roads. The network in the 45th century was rich and well-established, serving all the distant distances of the empire, all the most modest and most trivial stars. Indeed, at that time, by progressing that by "jumps of flea", laboriously, from system to system, humanity had managed to weave a vast network that borrowed cargos, methaniers and ships-colony. The traffic was considerable: Thousands of vessels, tens of trillions of tons of materials and various materials passed through these hyperspace roads. There was a control body, generally called "spatial control-SpaCon". The latter, which regularly changed place according to the extension of the empire, was a fact Chuzen (Neutrinales) transmission station. The first station was located on Pluto (2900), but soon it migrated around Ross 248 (Shenandoa), at ten light years. It remained there from 3454 to 4820. Then it was the turn of Alpha Corvi, 48 light-years away from the earth, a brilliant star that will be an unavoidable destination of the first empire. Hyperspace roads were managed by gigantic consortia, which could claim to use the patents of the AMAT capacitors and to produce the complex doors and relays. 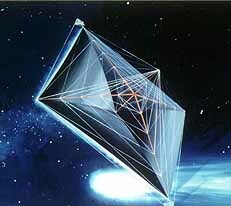 The basic principle was always the obligation to place the exit gate in service, and after several attempts (thousands) during which the probes sent materialized in the heart of a planet, a star Or even a large asteroid, or even a nebula, the hyperspace path was finally found by correspondence between the two gates. Over time, the colonial consortia in question had taken the habit of sending a first probe with a formidable Chuzen generator, which was very fast and had to collect all the information needed to facilitate the choice of stocks and cargoes by designating Or the terraformable planets, before finalizing the detailed plan of colonial operations, staggered over centuries. The enormous colony-vessel which left, had only the same propeller as the probe, with a power however multiple, but also a much greater mass. Arriving there a few centuries later, his first task was to put in place the industrial structures that would make it possible to build the rudimentary parts of the door, the rest, the modules and materials of high technology, being embarked. With the exit door put into service, it was necessary to carry out the correspondence by means of simultaneous adjustments on each side of this road. The consortium then used it to send other specific vessels, with less sophisticated propulsion, using methane, abundant and economical, and billions of tons of heavy equipment destined to launch the terraforming of the targeted worlds. Then the sending of thousands of settlers in hibernation was an aberration, a sending of a probe carrying gametes was put in place, much easier to store. Fertilization, the birth of future colonists Was done towards the end of the trip, so that settlement began when they were old enough to participate fully. This principle was, moreover, brought to its paroxysm with the nanocarbon naves, the only mass of which allowed a leap into hyperspace. The roads belonging to the consortia, they made heavily pay all the foreign ships to the systems of which they had ensured the colonization... So that this resulting in gross abuses, a true protectionism, the federation human, as elsewhere For the question of the legal affiliation of the colonized systems to the investors in these colonial operations, cut short in 4110, declaring that the consortia had only a lease for the purpose of returning to their funds after a Which was severely controlled. As a rule, the lease was 100 years old, so that all these roads eventually belonged to the public network, free of charge, the technology allowing the system to operate in complete autonomy. With this free admission of hyperspace roads, colonization took a fresh start. The effects were fully felt five centuries later. However some envisaged a simpler solution than hyperspace gates, complex to maintain and laborious to built. For reasons of short- and medium-term costs of research, an alternative solution was summarily studied taking the intervention of the settlement commission, the future guild of Concols, for these technologies to improve and mature. Hyperlight travel: Stargates for long were the only way to do it. The first experiments, carried out in 3608 to 3655, concerned the arch, a self-warping vessel that acquired a mythical value over time. She was conceived virtually in the 36th century and will only take shape in 3625. The principle was to place an hyperspace gate in front of the ship. The system was nothing short of a controlled self black hole, allowing efficient warping of space-time on pre-checked routes. The first arch was a radical departure over conventional AMAT turbines imagined and built in the 2000s which were not that efficient, only reaching a fraction LY. The reliability of the gate was far from obvious however, as this technology was still the object of researchs lasting for centuries, and was at the beginning far from perfectly reliable. Indeed the first vessel's trip was preceded by a series of controlled hyperlite cruises in short distances and unmanned mode to test the systems. The extravagant cost of an arch (officially called self-warping propulsion or SWP, soon turned to "Swap") required years of development and data acquisition with a debauchery of simulations. There was always, however, the wall of total uncertainty of reactions and interactions in such an unstable environment, which made these experiments lasting for years. Time being an old friend of cost increases, one had to carry out soon semi-experimental, scaled up carrying missions. So that the arch, which had undergone a billion modifications since her launch, made her first "useful" trip on June 16, 3648, of the universal calendar of the old era. The ship materialized 46 light years away, making it difficult to spot. The very first drone-like ships had on board an antimatter bomb which was supposed to explode, allowing the observers to track for a small observable supernova more easily. Unfortunately, this time, there was nothing but a slight increase in the transient luminosity of the Epsilon Andromeda star, 44 light-years away. The arch was lost, with the almost certainty that it had emerged from its journey in the heart of a star, and in fact the latter, or that it had succeeded but had materialized against all expectations hundreds or even thousands of light years, making it impossible to locate. Since it was not possible to conclude that the first Arch mission was considered permanently lost when careful observation of the spectrum of Espilon Andromeda revealed a signature corresponding to a slow increase in activity after a sudden cooling down, a sign of the action Assumed by an antimatter vortex in his heart. The second arch, already on plan in 3646, was launched in 3655. But this time, the incorrect setting of the gate caused a materialization accident, even before the vessel was in sight, A massive astral body. This accident, which marked the fall of the Transtellar consortium, dissuaded all others from doing the same. Technicians therefore retreated to the proven techniques of one-way hyperlite self gates. Progress was also made in the field of AMAT turbines allowing 1:1 speeds (one Ly per one year of travel), nominal light velocity, with the risk, however, of controlling considerable forces and dramatic instability. In 3785, a particularly complete virtual study of Smella Dachine was written, focusing on the errors of the arches based on technologies that emerged since. It was thought then to use a process of "critical mass", on the same principle as that of the real black holes by controlling the creation of hyper-massive bodies. Self-contained warping drives would go full length for yet another century. Such a balance was still illusory with the technologies available. After Dachine, tunnel hypergravititic fields were tested. Other studies were actually based on the principle of permanent, controlled warping bubble. It is worth noting that Han Pallava (3798), Ken Shibuya Donji (3811), Amar Lapis and Luttha Goodmyne in 3832 all tested "arches" with these kind of propulsion. At one point consortiums had practically gave up the very principle of a true hyperlite vessel, scalded by the disappearance of too many costly ships. But the idea was not completely abandoned in the higher spheres of the Terran power. On this land deserted by Marso-Alphites concessions, the earth put together an active search for propulsion systems that could ultimately give it a considerable advantage over its rival forever. Now benefiting from the support of the Venusian elites, it set up a vast program of virtual tests up to 4250, with self-learning IAs of the latest generation. The lack of scientific responses to refine programming was transformed into multi-stage assumptions that required considerable Quantum computing power, even using long-refined supercooled systems. Martian technological advance was still formidable. At the conclusion of the 4250 test campaign, Mars had turned the test results to pieces by taking out the results of secret tests carried out on old hyperspace roads, in particular interrupting hyperlite paths, proving even if they were Necessity, the absolute impossibility of achieving it. The idea of ​​the hyperlite was once again dormant for centuries. The solution came in the strangest and most mysterious way. In reality we now know the most probable hypothesis, ignored but above all hidden for centuries. Basically, there is the settlement commission. It is an organ of democratic control, an emanation of the federal assembly, and has gained considerable weight later on. At the beginning of its history, long before its founding in 2915, the idea existed of an organ of ethical control of spatial colonization. In the more or less probable hypothesis that man would encounter a form of life, even an extremely simple and primitive one, it was necessary to determine whether his presence on this world and the resulting inevitable pollution might compromise the evolution of This form of indigenous life, eventually towards a future so-called intelligent species, or more generally the constitution of a new biotope. Behind this idea lies the old idea of ​​right to life defended by anti-abortions. A resurgence in other areas after the birth rate has been shaken by the eugenic drifts of the artificial matrix system, referring pregnancy and childbirth to the barbarities of the past. Whatever the moral value of his commitment, he was sincere, perfectly sticking to a certain messianic idea of ​​the presence of man in the universe, bringing life and preserving it when needed. Virtually unanimously, this commission elaborated a legal corpus defining the existence of sanctuaries in case of discovery of an indigenous life, which had to ad vitam eternam remain pure of any presence, even orbital, of the human being, creating a cordon of security , A vast exclusion zone with several AUs of the planet. Draconian conditions, which were unfortunately very little respected, in the face of conspiracies omnipotent and determined to make their conquests fruitful, but also of the indigence of the means granted to the commission to carry out its work. Irreparable losses for the future were thus consumed, and even rapidly, as evidenced by the events preceding the colonization of Procyon-5 alias Nuwo. It is true that there is still doubt about the authenticity of these local life forms, and on the other hand, Nuwo was a world that was closest to the earthly case encountered so far, and one of the planets More famous and more influential afterwards. Other areas were also under the supervision of the Colcom: Compliance with the social and human rules laid down in the federal constitution in the course of colonization operations, which encompassed a large number of situations over a very long period of time and aimed at Avoid abuses committed by private groups that care little about their immigrants, as evidenced by Martian history. Generally speaking, all legal issues that are relevant to the rights to planetary property and their usufruct. The Comcol was empowered to give its opinion, for example, on the clauses of the so-called "taking possession" of a private group, contested by the planets, that the mere presence of an orbital probe was no longer sufficient, As an effective and autonomous basis. But this latter clause was also the subject of dramatic abuse, and it was ultimately required that the owner group should only be equal to the investments made, and insofar as it allowed the establishment and Maintenance of a local space route. Finally, the Colcom dealt with very unlikely cases in the utmost secrecy, a discovery that changed its very nature and shattered the technological fate of humanity: The discovery of vestiges of an intelligent life on an apparently virgin world of life . This type of mission, which was confined to archeology, was somewhat removed from the traditional role of the Colcom, while remaining attached to its roots, for it was a question of preventing these supposed vestiges, before they were authenticated, Do not suffer the outrages of a human presence. It is now clear, however, that this Colcom was informed by a group of researchers of the Alpha system of the lyre (at 25 AL of solsys), of the presence on the sixth planet of a Strange geological traces that are difficult to explain by the theories then running. We do not know what it really was, but we can only observe that, after the receipt of these complete data by the commission, the commission ordered the provisional placing of this world to the rank of sanctuary. This measure, enacted in 4318, has never been lifted since ... You can think of what you want, but about sixty years later a complete team of researchers, the largest expedition financed by the Colcom was sent on After a five-year stay, confirmed that it was a sanctuary, and that the Colcom demanded, in a more virulent way than ever, large credits to validate the defense of the sanctuaries in its custody. At that date, out of 760 colonized or known stars, it had sanctuarized 6 planets, which was far from negligible and proved if necessary that life was a phenomenon of the most natural and not exceptional. The federation, which had influential members who had acquired the ideas of the most extremist expansionists and fundamentally opposed in principle to the Colcom, nevertheless, after months of negotiations, agreed with the commission by releasing a credit unprecedented for the time . Thanks to the latter, the Comcol was able to set up a network of own detection and control system, at least able to identify potential intruders and to alert the federation that took sanctions. The memory of Shemrab and Laypeda, two sanctuaries violated and colonized, not to mention Nuwo, was still burning. Usually, a number of research reports are published on the sanctuarized planets. The human presence is not tolerated, but at least that of perfectly sterilized cybernetic probes. In the case of Alpha Lyra-8 or Alfalira-8, a first report was published on the presence of a life, but without specifying its exact nature, which only added to the trouble. Shortly afterwards, a second report, the last one reported simple molecules of amino acids, basic bricks of life, the most common. No one checked and Alfalira-8 kept all its mystery. By observing its surface via satellite orbital telescopes around neighboring planets, one could not help questioning some unorthodox geological formations. Nevertheless, the interest it aroused passed away, and gradually faded. In 4600, it was only one more name on the endless list of worlds known to man. It is in the 48th century that the term Tachyonic, which although it had existed for several millennia, could not be applied to the kidney of what man had built, appears almost without antecedent. The latter, although condemned to chip-breaks from system to system, spent a considerable part of its energy in serving the newly conquered worlds without providing the necessary funds for the construction of a new arch capable of carrying out The big leap by own means. The Tachyon, a measure of supraluminic velocity, which can be compared to the whole family of particles close to neutrinos, applied here to defining a new type of vessel, apparently apparently between 4768 and 4775, and giving no indication as to Its method of propulsion, which must be renamed in this specific case attraction or even folding of the spatial framework. The vessels or naves of the tachyons are, to say the least, turbid, and in connection with the Colcom. In 4768, a virtual demonstration is successfully carried out of a radically new method to perform a hyperspace leap. It is demonstrated that a very particular arrangement of AMAT capacitors and concentric beams are able to cause the space-time frame to fold not in front of the vessel, but inside it in a special chamber. There follows a chain reaction which aspires the entire vessel in a direction and a distance that is a function of the original settings. Now, whether this is the chamber or the settings in question, no research, no thesis, makes mention of it even though the studies of tens of thousands of engineers who seek this holy grail Astronautics for centuries have been written on the subject, but never even touched the principle of these technological revolutions. The functioning of this ship therefore appears to be part of a spontaneous generation in terms of research. Anyway, the Tachyon nave is superbly out of time and space in virtual universes, and investors are jostling soon. The federation will appoint a team, and the nave was started, with a first attempt planned in 4772. The latter, against all expectations, does not produce the expected miracle, and is lost. The nave is volatile, but also the investors, who no longer believe in the revolutionary processes implemented. It seems now after a thousand years of searching and costly attempts that the Superlite is tainted with curses. It is now known that the team probably benefited from technologies or research indications, but that these elements may have been deliberately oriented to create the illusion of a staggering technique, according to Minagata Yuhos thesis. However, the experience was reverted to light-years away, in the Mucazupi system (Mu Cassiopeia), and apart from any media advertising. The nave was scarcely different, and above all the promoters of this historic essay made themselves most discreet. And this time, the nave went to 125 AL from there, around HR5864, renamed Promsend from an old expression probably meaning promised land. And, more extraordinary, the nave returned without encumber, having deposited some automated probes. Still in the utmost discretion, the ship was separated into sections and divided into hundreds of patents, quickly placed on the central information network of the federation, a means of considerable dissemination while blurring the maps. As a result, in the years that followed, dozens of space transport companies were created around these new types of Tachyon naves. It was even surprising to find this normal, since the media did not devote the attention it deserved to this very important page of human history. It is true that other events occurred simultaneously, including persistent rumors of autonomous decorporations, the first great revolt of the functionaries, and the war between the federation and the guild of the Procyo-Marso-Centaurian colonies, in the throes of The creation of the first empire. And without all mankind then becoming fully aware of it, divided as it was, the reign of the guilds of hyperspace roads was drawing to a close. Henceforth Hyperlite autonomy was no longer a hope. No star would remain inaccessible, and already they would cling in the shadow of the titanic projects of empires covering large portions of the arm of Orion of Lactavia. The 49th century marked the beginning of a new adventure, freeing even the sense of time and space. With the end of the millennial policy of bug jumping (Bugjupp), in the 49th century, the first empire quickly moved to an area of ​​more than 50,000 potentially colonizable stars. So only the most promising of these are targeted. They are no longer systematically class O, B or even A, but above all F, G and K whose radiation remains able to afford a modest ZCH. The first, too hot and irradiating, even prevent the approach of their worlds telluric close. It will often be necessary to be satisfied with the satellites of their distant gases. But even in this case, there remained thousands of planets to terraform. The first empire then hardly begins to constitute zones of exploitation based this time on whole stellar clusters. The arm of Orion, however vast, is the new territory to be traveled. The Doms, fond of dwarf or old stars, K, M, begin to consider colonizing the external part of the arm, going towards the galactic center, rich in stars of this type. But they also plan to try to get a foothold around the very bright young stars, neglected by this fact. Eventually, the Doms begin to become more aggressive than the expansionists. Tensions arose from 4920, when the inner edge of the Orion arm became more attractive to the settlers of these two civilizations. No one knows why, while for centuries attempts to create hyperlite vessels have failed, these become as common and reliable in barely a decade. No one really thinks about it, because the fact is there. The yards are overflowing with activity, but those who built the hyperspace gates do not cease their work: The tachyons are still relatively expensive and vast. These are the most gigantic vessels of all those launched, including giant ships. So that to detail the situation, it should be pointed out that still 98% of the space traffic was through these gates, as it was not simple interstellar flight. These doors have evolved for more than a millennium, and long-range versions have long been put into service, capable of serving two distant stars of 20 light years, just like, in the other direction, A very dense network of interplanetary routes within the systems themselves. 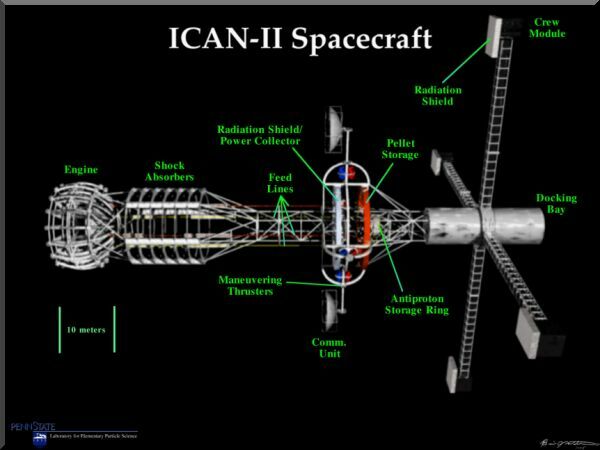 As a result, nuclear propulsion, hydrogen-based, popular and very economical, still predominates, and AMAT turbine vessels with antimatter are generally long-haul cargo and LNG tankers serving remote areas of systems that can not To use the interplanetary gates by their mass. As a result, the Tachyon Ships, which are at the top of this hierarchy, play the role of mother ships, to which have already grafted several vessels already consequent. Third generation colony vessels, capable of carrying smaller tachyons themselves, are able to colonize more than 20 stellar systems in as many years. But the consortia have disappeared for centuries, replaced by planetary, then stellar guilds, and finally interstellar groups, the only ones capable of chartering such leviathans. For example, the CV-125 Thiarrowade, launched in 4894, measured more than 75 kilometers for nearly 225 million tonnes. Their dimensions explained, by analogy with the first machines to use AMAT turbines, with the difficulty of containing and exploiting energy that reached the limits of decency: It had been calculated that if an AMAT imploded, it would be responsible for a spherical wave, a real tidal wave on the spatio-temporal framework, and a beautiful and ephemeral nova. On the other hand, if the critical mass factor was reached, the Tachyon could cause a black hole to persist in the area for millions of years. Finally, the gigantism of these vessels is explained by the presence of very advanced technologies, which are all industrially badly digested and reinterpreted with the means of this period, not going beyond the nanometric scale, and replacing rare components see Not found by more standardized systems but also more greedy of space. While there was a great expansion, it concerned above all the expansionists. Indeed, the deviant urbanists who were the virtualists were in withdrawal from these numbers. The Grinnian movement was not yet known and Ottowans was not heard. The vast majority of humanity then entered this voluntarist category. The foundation of an empire possibly implies an emperor. In the specific case, the empire was only the convenient name for the formidable aggregate of systems under the rule of the Solsyan powers. For if the earthlings had long emigrated to Venus, and the Earth sanctuarized, it is indeed the Martians who constituted the original branch of the great majority of the colonists. However, the situation changed from the beginning of the 4800s. The traditional triumvirate embodied by the Procyo-Marso-Centaurian alliance was defeated by the exceptional success of new worlds, the most famous of which is undoubtedly Ton. Gravitating around a star located halfway between the Orion nebula and the original nucleus of the first empire, 485 AL of Solsys. This ideally placed system would become the center of a vast commercial federation with strong impetus for independence from the Solsysian empire. As the centuries passed, Ton, who experienced many major events, formed a competing empire, fiercely autonomist. A war later, in 5840, was founded the second empire, an aggregate of 225,430 colonized stellar systems. The fact that a colonized system finds itself in an extremely distant position has made rapid and advantageous the constitution of a vast set of own systems from this nucleus. It was on this postulate that it was founded and rapidly assumed its independence from the first empire. Imitated by many equally favored systems, the cohesion of the empire was greatly threatened. A new need to aggregate these dissident systems in a satisfactory manner, and to integrate the empire Dom then radiant and already very independent of fact, required a new entity much more flexible. The second empire thus usurps in a way a title that does not describe reality: This new organization is in fact only a confederation of stellar empires with virtually nonexistent powers. His only materialization consisted in an assembly, precisely installed on a planet Dom, Veyganda, in order to spare the latter. In fact, all the norms were established by the federated empires, which alone had a real moral authority. The founding act dates from 5890, the assembly of the second empire being installed on Veyganda in 5895. The second empire consisted of 267,000 stars, comprised of a dozen empires, and thousands of unions whose names differed, from the sub-federation (Subferecon) to the community of economic interests (Ecointecomu). The other non-aggregated systems were part of the second empire as autonomous systems, some large forts, such as keideki (type B2Ia) with three levels of captive systems. Such a system comprising 5 stars and more than 325 planets and planets could of course appear as an empire on its own. The largest empire existing within the confederation was, of course, that of the Doms, so great was the latter. The expansionists opened the ball but classically abandoned the majority systems of red and brown dwarfs. So that the Doms reigned over thirty times more planets than the expansionists. Integrating them into the second empire did not change much. However, despite its immensity, the Dom Empire did not pose a real threat to the expansionists because of its relative lack of cohesion. There were only a few central political structures with deliberative functions, but most of the power was delegated to systems that had mostly only trade relations between them. The Tonite Empire, following the peace accords, lost its political influence but not its cultural and economic influence. As a result, although it was declining, it remained the center of an empire of 133 systems, a pole unavoidable on the road to Orion. At the beginning of the seventh millennium, the use of giant colony ships expanded faster than ever the second empire, which had scarcely crossed 500,000 systems in 115 years.